Michael and Jeni Guy of Wycliffe are currently serving in Papua New Guinea and became part of our Hephzibah family on July 1, 2014. They are joined on the mission field by their two sons, Robbie and Timmy. Wycliffe’s focus is seeing lives changed and communities transformed through having the Word of God in their own heart languages. Michael works as the Shipping Manager and Security Manager for their center which includes over 450 adult ex-pats and 10+ PNG employees that live there and he works in the Store and fills in wherever needed. Michael Guy – I am Michael Guy. I am married and have two sons. 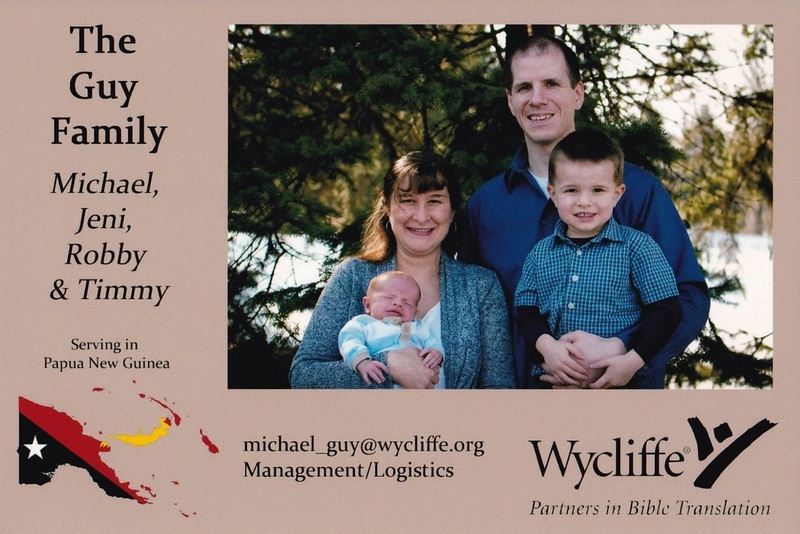 My family and I are missionaries with Wycliffe Bible Translators and we serve in Papua New Guinea(PNG). I am using my degrees in Business Administration and work experience as a US Army Transportation Corps office, restaurant supply store manager and inventory control manager in the US to serve the support needs of those serving in Bible Translation in PNG. I am currently managing our organization’s shipping department and finance department. I have also managed the security department and the store in the past. I am glad that I can use my prior work experiences and education to fill in the gaps in management as needed to further our organizations desire to eradicate Bible poverty in PNG. PNG is an island country that is located directly to the north of Australia. It is known to have about 830 languages with about 300 of them that do not have even one page of God’s Word translated into their language. Most of the country is jungle and mountainous terrain which has lead to isolation of the people over thousands of years. The people of Papua New Guinea mostly still live in traditional bush material houses, maintain large gardens to live off of and are uneducated or undereducated as compared to the Western world. Our organization is currently at work in around 200 languages and is partnering with other organizations to share our knowledge and resources to speed the pace of Bible translation. One of the exciting things that has come about over the last few years with better technology is the recording of scripture on solar powered audio players. This allows the people to be able to listen to God’s Word as many still cannot read or have difficulty reading. God’s Word is changing lives and transforming the communities of PNG. AMEN!!! Jeni Guy. I am Jeni Guy. I spend my days supporting my husband in his work and taking care of our two young boys. I grew up as a child of missionaries. My parents served in various places in the US, as well as serving in England and in New Zealand. I was able to serve in various roles alongside my parents over the years too. In Papua New Guinea, I enjoy using my skills in hospitality to provide meals to help new families to feel welcome to our community as well as to help current families in their varying needs. I am also glad that I can open my home in hosting a small group and a ladies’ Bible study. In 2008, Michael lost his work as an Inventory Control Manager as the economy crashed. He was not able to find work though trying for more than a year and a half. The Lord provided for us in many ways during that time. Through volunteering at a local rescue mission and reading stories of missionaries, Michael got the desire to go into missions. He was quite excited when he realized that Wycliffe Bible Translators could use his abilities as a manager to serve almost anywhere in the world. Papua New Guinea had the greatest need for managers and was an easy choice for us to go and serve there. We are grateful for the family, friends and churches that are faithful in praying for us and financially supporting us as we serve and work alongside of the people of PNG to see the Bible translated into their languages.